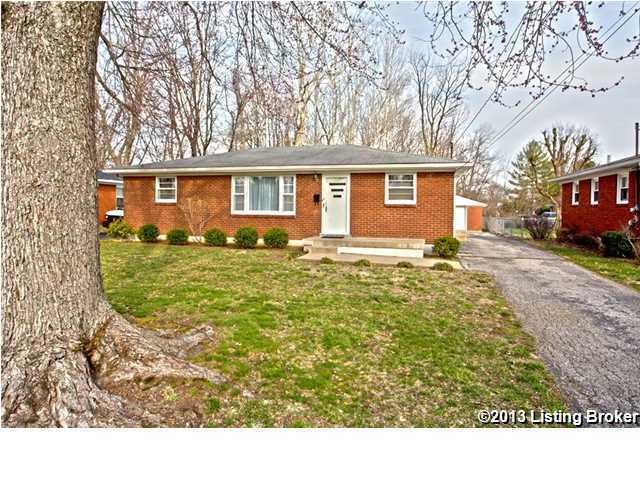 Move in ready brick ranch is ready for quick possession. This home offers 3 bedrooms, 1 full bath, eat-in kitchen. Beautiful hardwood floors throughout and the kitchen & bath have new ceramic tile. There is a detached 2-car garage with loft space for extra storage. The laundry room is located off of the kitchen. Newly painted with neutral colors throughout. The quiet street is ''P'' shaped & only has one entrance and exit. The home has been well-maintained and ready to become your home. OPEN SUNDAY, APRIL 21, 2-4 PM. 121 Southview Ter, Louisville KY 40214 is a Home, with 3 bedrooms which is recently sold, it has 1,134 sqft, 0 sized lot, and 2 Car Garage,Detached parking. A comparable Home, has 2 bedrooms and 1.5 baths, it was built in and is located at 6341 Strawberry Ln Louisville KY 40214 and for sale by its owner at $ 165,000. This home is located in the city of Louisville , in zip code 40214, this Jefferson County Home, it is in the NONE Subdivision, and HARDWOOD FOREST are nearby neighborhoods.